A good ramen is one of the most rewarding dishes you can eat, full of noodles, meat, eggs and with a really thick delicious broth but it does take a long time to prepare and there are a lot of procedures. So be aware, this recipe is kind of long but don’t be afraid, as long as you prepare all the ingredients, such as the ramen eggs, char siu pork and stock a day before then on the day it’s pretty quick to prepare. I personally spent around two hours making the stock for this dish. I didn’t want to simmer it for too long simply because of time constraints but in really good ramen restaurants it’s not unheard of stock be cooked for half a day to a day or even more. As with most stocks, the longer you cook, the better they taste and ramen is true of this. A good example of preparing the ingredients in advance as I mentioned above is the stock. Quite often I’ll cook a LOT of stock then I’ll separate it into small portions and store in a freezer. You can do the same thing with char siu pork as well. If you like the egg quite runny then set your timer to 3 minutes. I like to cook them for 3 ½ minutes but some recipes online say 4 minutes but personally I think this is a little too long. I always cook a couple extra eggs for two reasons. The main reason is just in case the egg shell breaks during cooking, if this happens you may end up with only 3-4 beautiful boiled eggs and the others will look alien. The other reason is the eggs taste so good and my husband has sticky fingers so inevitably a couple/few eggs go missing during cooking. Please consume these within 2-3 days and always use fresh eggs! I used red onion in this recipe for making the char siu pork but you can also use white onion. I just use the ingredients I had at home. I used a banana shallot in this recipe which is really quiet big in size so I only used 1. If you use a normal sized shallot, use 3 cloves. As mentioned before, if you have any extra stock you can separate into small portions and store in a freezer for another dish or meal. Stock can be stored for up to 1 month in a freezer. I will also keep the char siu pork sauce and ramen egg sauce in the freezer so I can use for another time. You can keep them in the freezer for a month and re-use them for 2-3 times. Add all the seasonings into a saucepan and bring it to a boil and let it boil for 5 minutes. Turn off the fire and leave to cool down. Place 8 eggs into a saucepan and cover with water. Bring it to a boil and once it’s boiling set a timer to 3-3.5 minutes. Gently stir the eggs while cooking so the egg yolk will be in the middle. When the timer has stopped, immediately cool down the eggs under running cold water. Gently peel the eggs and marinade the eggs with the sauce from step 1. You can store the eggs with sauce in a freezer bag or container and leave them to marinade for 1-2 days. Cut kombu into small pieces (3cm long) and place into a stock pot with 3 litres of water for 20 minutes. After 20 minutes, place step 1 on a stove and use medium-low heat to cook for 10 minutes then turn the fire to highest temperature and bring it to a boil. Blanch the ribs and wash with cold water. Leave it aside. Add Katsuobushi into step 2 and simmer for 5 minutes. Turn off fire and leave it to cool down. Pass through the stock with a sieve and keep the katsubushi and kombu on the side. Put the stock back into the stock pot and add ribs, onion and garlic. Bring it to a boil first then simmer for 1 ½ hours. Pass through the stock with a sieve and leave it aside. Roll the pork belly and use cling film to wrap it very tight. The pork belly should resemble a cylinder shape. Freeze it for few hours. Take the pork belly out of the freezer once it has turned hard. Remove the cling film and use string to tie it up. Heat up some oil in a frying pan or skillet and pan-fry every side of the pork until it’s golden brown in colour. Leave it aside. Use the same frying pan and the oil left over to fry red the onion, shallot, spring onion, ginger and garlic until it’s aromatic. Put all the seasonings apart from the honey into a big stock pot. Place step 4 and the pork belly into this stock pot. Bring it to a boil first then add honey and simmer for 1 ½ hour or until the pork belly is tender. Leave it to cool down. Place pork belly and remaining sauce into a container and store it in the refrigerator over night. Slice it before serving. Cook the ramen noodles by following the cooking instructions on the packaging. Heat up the stock in a saucepan and put the miso in a small bowl then mix with a little bit of warm stock evenly. Make sure there are no lumps and pour this mixture into the stock and bring it to a boil. Season the stock with salt and pepper. Turn off the fire. Place the ramen noodles in a big bowl and pour the hot ramen stock from step 2 into the bowl. Garnish with char siu pork, spring onion, seaweed and eggs. Ready to serve! Recently my morning sickness is starting to pass and I’ve started cooking again. It feels really nice to cook again and it feels equally nice to start sharing new recipes with you again. I made this Japanese chicken meatball and udon noodle soup recipe today and it’s so delicious. Well, my body and my baby really like it anyway. I’ve found one of my biggest challenges of early pregnancy is to find food I like. I discovered to find the right food during early pregnancy is almost like mission impossible. I’ve never been picky with my food. There are literally just a handful of foods I really don’t like but most of my favourite foods I now can’t stand. I’ve also found pregnancy makes me feel really bloated, so no heavy meals at all or I will fill bloated and ill afterwards. I’ve also always really liked Japanese food but through my first trimester Japanese food is the one thing I can regularly eat and really enjoy. I guess this is because Japanese food is really light to eat, extremely fresh and Japanese food tends to be a little bit sweet. Oh, and I love icecream now. I’ve become obsessed with Cornetto’s! So even though I know how to make quite a few different kinds of sushi I’ve now started to collect Japanese recipes online and to buy recipe books. I’m definitely not an expert with Japanese food but I do know a few recipes and I’m also one of the biggest fans ever of Japanese. Chris is loving this btw as he absolutely loves Japanese food. Here is the first Japanese recipe I will share with you. I’ve also attached the baby scan I had last week. We discovered our baby is 11 weeks and 4 days old and measures 4.8cm long. It was incredible having the baby scan. Both Chris and I were nearly in tears watching our baby jump in my womb and watching it shake it’s arms and legs as well as seeing it’s heart beat. To say we’re happy and excited is an understatement. 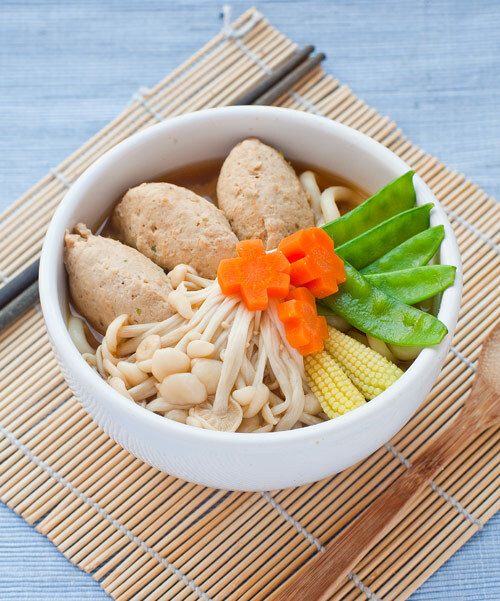 So anyway, hope you like this pregnancy friendly Japanese chicken meatball and udon noodle soup recipe. Cut the chicken breast into small dices. Roughly chop both the spring onions and shitake mushrooms and put the chicken breast, spring onions and mushrooms into a food processor. Blend everything together until you’re left with a fine mixture. Add eggs, soy sauce, salt, pepper powder and ginger into the processor along with everything from step 1. Blend again for between 1 and 2 minutes. Boil some water in a pan. Take 2 tablespoons and roll some of the mixture between the spoons to make the meatball shape. Once you have a meatball place the meatball into the boiling water to cook. When the meatball has risen to the top of the water the meatball is cooked. Place the meatballs aside for now. After all of the meatballs are cooked use the same water you used to cook the meatball for stock to cook the noodles with. Before placing the noodles into the soup make sure first of all you have enough water. If necessary you can add some more. Also before placing the noodles in the water add spring onions, miso, soy sauce and salt to season the soup. Make sure the miso has completely dissolved in the soup, there can’t be any lumps at all. Once the soup is boiling place the udon noodle in the boiling soup and allow to cook for 2-3 minutes. Once the noodle has cooked then add all of the vegetables and the meatballs into the soup and allow a minute or two for the vegetables to cook. It’s now ready to serve.